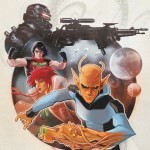 Legion of Superheroes #1 – In what appears to be a companion piece to the story in Legion Lost #1, Paul Levitz helms the writing duties for the return of The Legion of Superheroes with art from Francis Portella. The storyline for this issue, and assumedly story arc, is that The Legion is dealing with a loss of what appears to be the characters in Legion Lost, as it takes place in the 31st century. I’ve always been interested in The Legion, but with all the team line-up changes, all of the deaths, and creative teams, the title has been, for me, hard to get into. Now, I know I’m not the biggest fan of the relaunch, but I truly believe that Legion of Superheroes will benefit by this. 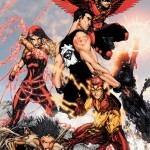 Teen Titans #1 – Oh man… I’m sorry. Just check out that artwork for a minute. Okay, done? Wow. I’ve been reading the current run of Teen Titans for a while now, and it’s had its ups and downs, but I seriously don’t even know what this is. Tim Drake has wings, Superboy looks ridiculous and has a tattoo (how do you scar someone who’s invincible? ), Wonder Girl is a thief, and then there are some crazy characters that no one seems to know. And by the look of the solicitation, it appears that Tim Drake was never a Robin, but that’s speculation on my part. The writer for this book is Scott Lobdell, who can do great things, and the art is from current Justice League artist Brett Booth, whose art I genuinely love, so who knows how this title will go. The concept seems a bit insane, but the talent has a lot of potential as a team and could very well tell an incredible story. And if you don’t like the character designs, or the art seems weird to you, Booth has announced via his official website that DC used a promo image he did for the pitch. It’s not the final cover. 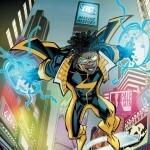 Static Shock #1 – A personal favorite, and a title that I’ve been anticipating for a long time, even before the announcement of the DC relaunch, Static Shock is finally returning! 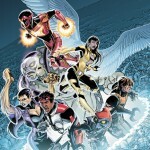 Dwayne McDuffie‘s creation from the Milestone line, that showcased diversity amongst super heroes, was scheduled to experience a relaunch of its own in the DC Universe headlined by Static Shock and Xombi. Static Shock was scheduled to be penned by McDuffie prior to his untimely, and truly tragic death, while Xombi was to be handled by John Rozum as writer. And while Xombi was able to proceed as planned with the art of Frazer Irving, Static Shock, unfortunately, seemed to be in limbo. So it’s a great pleasure for me to see this title arrive with the writing talents of John Rozum and Scott McDaniel, with the art of Scott McDaniel and Johnathan Glapion, another personal favorite. All of the creators seem to be truly invested in what this character means to fans, as well as what he meant to his creator, Dwayne McDuffie. This title is a must buy. 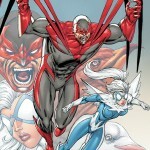 Hawk and Dove #1 – The return of Hawk and Dove will be written by Sterling Gates, with art from the returning industry legend and Deadpool creator, Rob Liefeld. I’ve liked some of what I’ve seen from Gates, while I’ve been less than impressed with some of his other work, which is fine. That’s a personal preference. A lot of people absolutely love Gates, and I’d be willing to give this title a shot because I still want to like him. Liefeld, however is not an artist that I enjoy, at all. I respect immensely what he has done in the industry, and I share the same amount of respect for all of the Image founders. But Liefeld has a very specific style that embodies the art style that we saw in the 90s, which makes sense because he found his legendary status during that time period, and there are a lot of people that absolutely love his work, I’m just not one of them. This book is pretty exactly what I don’t want. The title character are ones that I really don’t care about, although I’ve been trying to like them, the writer is someone who I’m not completely in love with, and the artist is from someone I respect, but I just don’t enjoy. I have literally zero interest in this book. But that’s going to wrap it up for these titles. Are you excited by these titles? Is DC changing your mind about the September relaunch? Let us know in the comments section below! And next time, the return of Wildstorm and murderers!